we provide comprehensive support services which span every step of your treatment with us. We understand that every patient’s needs and requirements are different, and hence to provide the best patient services possible, the international division assists our patients from start to finish, patient representatives are highly trained and act as a point of contact for all your questions and requirements. Our patients and their caretakers are received at the airport by our Airport Manager, and a complimentary transport service is provided to the accommodation/hospital on availability. We have patient service representatives who can speak in Arabic, French, and Bengali. We also help in providing other language translation services on request and availability. International patients can seek a medical opinion from Narayana Health’s team of experienced and qualified doctors in a wide range of medical specialities. The International division also provides patients with treatment and visa invitation letters to help patients obtain a medical visa. The meals served to patients are supervised by the dietary department at Narayana Health. We offer healthy, international cuisines including continental, Middle Eastern and African. 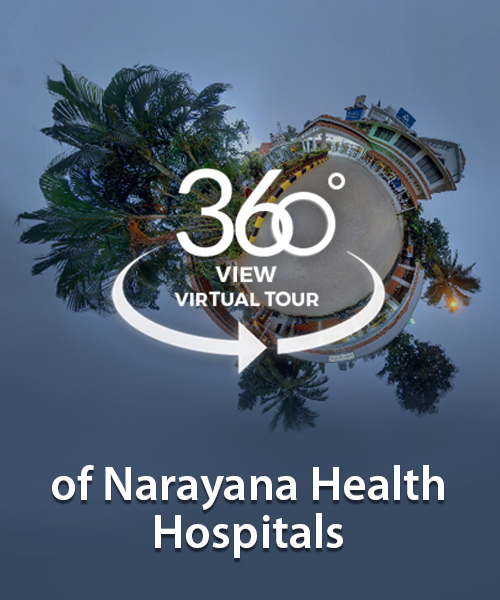 Narayana Health understands and respects all beliefs and faith of patients and their attendees. The hospitals feature prayer rooms suitable for all. We understand the need for patients to keep updated with local and international news and events. Our suites feature televisions broadcasting International channels including Al Jazeera, France 5, BBC, etc. From assisting in booking air, train and bus tickets, providing sightseeing information, to processing Medical Form (MEDA) and currency exchange, the dedicated Travel Desk at every NH facility provides all the necessary travel assistance to our patients. Our patient representatives provide patients and their families assistance with various legal and administrative formalities such as FRRO, Visa extension, police verification to name a few. Narayana Health provides a wide choice of patient rooms to suit individual requirements; from well-furnished, world-class individual suites at the Platinum wing, state-of-the-art deluxe private rooms to comfortable shared rooms. The international division at Narayana Health maintains long-term relationships with patients to ensure continuity of care, and assists in setting up communication between doctors and patients.